This Contested Document is a first for the Moonspeaker, in that it is also cross-referenced in the Essays section. Before leaping into the topic at hand, it is only fair to give a shout out to Maria Popova whose website BrainPickings is an ad-free, reader-supported, remarkable and growing collection of "annotated readings." Popova has explained in various interviews and articles that she does not write "reviews" as such, because she prefers to think and work deeply with the books that she enjoys and finds moving. Not every book she connects with will appeal in a similar manner to someone else, nor will every book that she doesn't connect with fail to appeal to others. This is a respectful and humble approach to reading and discussing books that I hope to emulate successfully here, not least because it is consistent with what I have learned from Métis and Cree approaches to engaging with the words and works of other beings in a good way. I suspect there are not many people who would deliberately set out to read a writing style guide, let alone an editing style guide. However, Elements of Indigenous Style intrigued me on several levels when I spotted it on the shelf at the bookstore. The cover is striking in and of itself, as a well-designed professional cover is meant to be, yet it was the title and the fact that the book looked to be less than 150 pages that made it a must-have. There aren't many authors who eschew successfully in spite of house styles and editorial fiat the definite article in a title. Of course, Gregory Younging is better equipped than most to stick to his guns on the point, being an experienced professional editor himself. So from the start, we are reminded that this book does not cover, and on dipping into it learn that Younging is quite clear that it cannot cover, all the elements of Indigenous style. This is not an attempt to ordain from on high, and the subtitle reiterates the point, and Younging states in the introduction that this guide is designed as an ongoing project to be updated at intervals. 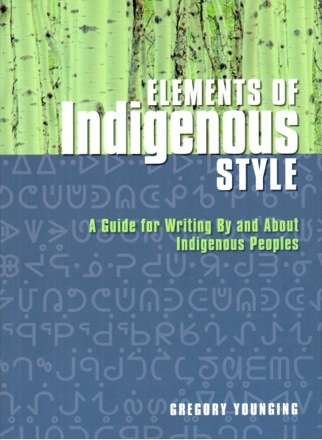 This is typical of style guides, although in this case there is a real likelihood that this guide will be updated more frequently than other members of the genre, simply because Indigenous terminologies are contested and caught between colonizer efforts to co-opt them and Indigenous peoples seeking words and modes of writing that speak with accuracy and respect. In other words, this slim and moderately priced book (twenty dollars canadian) packs a constructive wallop. Elements of Indigenous Style, cover by Carol Dragich, 2018. This book is not just a guide to tasks like appropriate capitalization and word use for writing that involves Indigenous peoples and materials. It presents a philosophy of writing and editing in what can be some of the most socially and politically difficult contexts, beginning with Younging's definition of "The paramount purpose of literature focusing on a specific cultural group should be to present the culture in a realistic and insightful manner, with the highest possible degree of versimilitude. However, the body of literature on Indigenous Peoples mostly fails to achieve this standard. "1 He adds an unhappily necessary caveat, that "The failure comes from a colonial practice of transmitting 'information' about Indigenous Peoples rather than transmitting Indigenous Peoples' perspectives about themselves. "2 At this point it may be tempting to categorize this as an example of overthinking, but the lack of explicitness about why we are writing literature focusing on a specific culture group is a lack that can run us into trouble. Without a touchstone of this kind for the work, it is all too easy to repeat stereotypes and other unwanted tropes without realizing it. An interesting presentation choice that Younging makes is to refer to "the Indigenous Voice" from almost the very first page of the guide, yet he keeps back the explanation of this term until much later. At the risk of spoiling his intention, which may have been to keep the reader pondering what the Indigenous Voice could be intended to encompass, his description is "The Indigenous Voice is among the literatures of the world, and comes from Indigenous Peoples speaking for themselves, with connection to their past, present, and future, and in an evolving conversation with their Traditional Knowledge and Oral Traditions. "3 This notion of literature as a conversation with our ancestors and our descendants, not flatly ignoring the former and rudely blowing raspberries at the latter, is a perspective on it that seems all too rare now. The pressure of late stage capitalism has led to a surreal redefinition of everything as a a consumable that will vanish with no lingering effects or projected effects, except, the marketers hope, craving for more of the general product equivalent of junk food. Enjoyable as junk food can be, it isn't enough for all our needs, and I haven't yet met a person who doesn't have at least one inherited recipe they love and that or another that they want to pass on to their friends and family somehow. How paradoxical is it, that there is such pressure to render writing itself into something utterly ephemeral, the very thing that europeans tried to claim was the only way to make "history." Then Younging briefly maps out the relationship between Indigenous Voice and the strange agglomeration of novels and criticism known as CanLit. "Canadian publishing has also had a tendency to pigeonhole the Indigenous Voice – this important, distinct canon of literatures – as a subsection of CanLit. It is not. It comes from different traditions that developed and evolved in Indigenous Nations long before CanLit existed. "4 This may be a controversial position, since it defies marketing common sense. More importantly, it defies an ongoing mainstream canadian project focussed on creating something distinct that asserts canadian cultural survival in the face of the popular culture juggernaut that is currently the united states that began in earnest in the 1960s. This seems a reasonable enough project, and once mainstream canadians concluded that they were not britishers who happened to be living outside of britain, it makes sense that they would be concerned to sort out just who they were then, and what cultural items reflected that. What has not been so reasonable is the bullheaded attempt to force Indigenous writing and people into the same molds. Having different histories, it stands to reason that "IndLit" and "CanLit" are distinct. Just as Younging does not shy away from the philosophical, he steps right up to the political. "In some cases, however, Indigenous style and conventional style or house style will not agree. When that happens, Indigenous style should override conventional style and house style. "5 I found myself thinking immediately of a quick word-substituted version, "In some cases, however, Indigenous views on whether to act on the land and mainstream views on whether to act on the land will not agree. When that happens, Indigenous views should override mainstream ones, in light of the deeper and more intimate relationships to the land Indigenous Peoples have." I am well aware that this runs afoul of incessant settler claims that Indigenous peoples should never be permitted to veto any settler schemes for changing the land because supposedly might makes right. Yet at the rate things are going and in view of the growing numbers of environmental and social problems that come directly from settler practices, it seems like it would be more than worth favouring Indigenous views and style. Thinking back to writing in particular, favouring Indigenous style would do a whole lot to avoid the word choices that later become sources of excruciating embarrassment for authors and presses. By now it is no doubt more than obvious that Younging is a past master at diplomacy. Take for example his masterful evisceration of the settler notion of authenticity. "Much writing about Indigenous Peoples by non-Indigenous authors reflects the idea that Indigenous culture is static and must exist in some past state to be authentic. "6 If authenticity can only be achieved by somehow exactly reproducing an arbitrary past state defined and selected by non-Indigenous authors, the result can only be a delf-defeating one that slides rapidly into caricature. Pseudo-authenticity of this type is rampant at tourist sites across europe and in the wooden repetitions of entrenched national rituals such as the sort of dress up and ceremony attendance the english Windsors are still permitted to indulge in. Something carved out from its context by refusing to allow it to adjust to the changing times and needs of the participants certainly doesn't feel meaningful or convincing, which are the qualities most often associated with "authenticity." Of course, then the question arises of who the writing or other cultural practice is supposed to be authentic to. With all this in mind, Younging's recommendations about how to deploy the past tense when writing about Indigenous peoples should make immediate sense. "Avoid the common error of describing Indigenous Peoples in the past tense... They hold Potlatches, they tell Sacred Stories, they have Traditional Territories. "7 and "[Indigenous Peoples] are living cultures that adopt new technologies and adapt to new circumstances in a process of complex navigation, but not of acquiescence. "8 On a related note, Younging deconstructs the term "discovery" as follows: "[Discovery], when used to describe European arrival in the Americas and other places occupied by Indigenous Peoples, literally implies that Indigenous Peoples did not exist as social beings with the capacity to occupy territory. "9 This is the ultimate implication of being somehow "unchanging" as well, as any person well-versed in Karl Marx's laboured explanation of how and why human labour is not the same as that carried out by bees. The curious (or perverse) reader is left with the implied exercise of trying to imagine how a community could continue to exist without changing, if such a thing is truly possible. The hope for a simple to apply rubric for all cases will likely shimmer before the eyes of many writers and editors reading this guide, especially considering that Younging and the contributors who composed it also developed twenty-two Principles of Indigenous Style,10 and there is a whole chapter called "Culturally Appropriate Publishing Practices For Indigenous Authors and Content." This hopeful bubble is one that Younging firmly bursts. "This chapter won't tell you 'what to do' so you can jump through hoops and check the 'did it' box. "11 But where there are definite things to avoid and ways of working to adopt, they are right there in black and white. Probably the biggest overarching way of working to adopt is the one with the most fraught name, "Collaboration assumes that works do not speak for Indigenous Peoples. It ensures that works are Indigenous Peoples speaking. "12 This is probably the approach that settler editors and writers alike find most difficult to accept and apply, because they have been telling each other for so long that they are the experts in what Indigenous people mean to say. After all, according to settler popular culture, white middle class men have an instinctive and complete understanding of all people, of all ages, all sexes, and all cultural backgrounds. Just watch almost any science fiction television program involving time travel. An already known and woefully underused approach to the names of Indigenous groups is simply to use one "...based on a reasonable approximation of the word an Indigenous group used to identify themselves in their own language (e.g., Haida, Dene, Okanagan). "13 There is a wonderful, terrible illustration of how to do the complete antithesis to this, which is to repeat the ludicrous and insulting designation "Mackenzie Eskimo" as if there ever were such people. The very idea that any Indigenous nation should be called after a glorified tourist as if they were a flock of butterflies unknown in his home country is bad enough. The imposition of a term from a different Indigenous nation's language that is derogatory in tone is even worse. Referring to non-Indigenous people this way is so unheard of that I suppose something analogous like the "Smith Dagoes" should elicit howls of derision and horror, as well it absolutely should. But alas, it probably wouldn't both do so and successfully make the point intended here. Pages 40 to 41 make a few key points about authorship and the relationship Indigenous knowledge has to the public domain, "...a person who 'writes down' Traditional Knowledge or Oral Traditions is not their author," and just because it is Indigenous, that doesn't make the knowledge free to everyone. I have encountered the argument that traditional knowledge that has already been published is out there, so we may as well go ahead and use it. The person making this argument was another Indigenous person referring to other Indigenous people. That said, I have to concede that Younging's careful explanation of why this is not an appropriate response is convincing and applies beyond such examples as early twentieth century novels that appropriate traditional knowledge in order to entertain non-Indigenous readers and exemplify the "authentic vanishing Indian. "16 That the knowledge is "out there" makes the necessity for following protocols more important, not less, in order to properly address the wrong already done. Last though far from least is Appendix D of this style guide, which is a new edition of Younging's paper "Gnaritas Nullius (No One's Knowledge): The Essence of Traditional Knowledge and its Colonization through Western Legal Regimes. "17 It stands as probably one of the best summaries of the history and development of copyright law as it impacts canada as a settler colonial state that has taken on british common law, and of how it inherently fails to respect or adequately protect Indigenous traditional knowledge. The problem comes right at the start, with the basic assumption that knowledge, its expression, and its publication, is only ever owned on an individual basis, and all knowledge must be released willy nilly into the public domain for easy exploitation by everyone. This defies the reality that traditional knowledge is communally owned, otherwise it could hardly be traditional, and it includes knowledge that cannot be tossed around at random because it is spiritually potent. The nearest parallel in non-Indigenous cultures today may be information about nuclear and biological weapons manufacture, and it isn't a very close one. With even just this brief description, I hope it is evident that the inclusion of this paper is an eye-opening bonus for the keen reader who opts to check the appendices. Twenty dollars canadian. In truth, Elements of Indigenous Style is underpriced for the quality of its content and the evidence of the deep and abiding care that went into composing and printing this first edition. Buy it, read it, use it. I will, even if I remain unconvinced by some of Younging's capitalization recommendations! Indigenous Languages, Focus "British Columbia"
Aisinai'pi "It Has Been Written"
"A Strict Law Bids Us Dance"
Is It Regalia, Or Is It A Costume? "Those Were the Dog Days..."
This title is a great way to remember when the spelling "principle" (basis, source, or truth) versus "principal" (first in order of importance, the top administrator in a school) is the one wanted. 2014 Duke University Press, Durham. The usage in this book cannot be explained as a self-consciously political choice on the part of the editors either, since so far as the contributor notes go, none of them appear to be Indigenous. See also We Are Not Yours for a bit more on the problems with this sort of usage in far less diplomatic terms. See Marc André Fortin's "'Ought We to Teach These? ': Ethical, Responsible, and Aboriginal Cultural Protocols in the Classroom," for the case of an early twentieth century novel by Marius Barbeau. 459-465 in Learn•Teach•Challenge: Approaching Indigenous Literatures, edited by Deanna Reder and Linda M. Morra (Wilfrid Laurier Press, 2016).